Billie Eilish: When we all fall asleep, Where do we Go? Album Review – ACC Interactive Media Arts Student Blog! 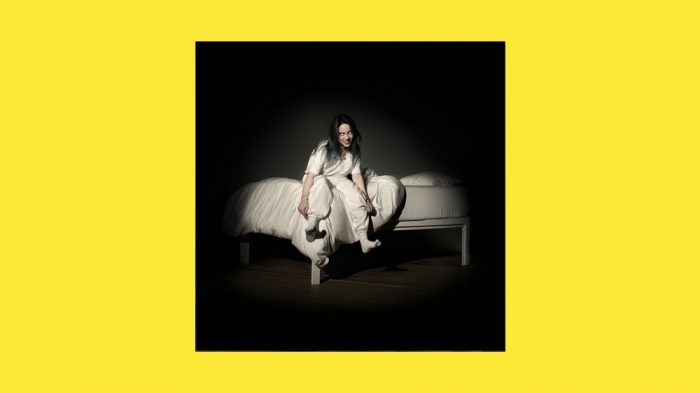 After releasing her EP don’t smile at me, March 29, 2019; Billie Eilish released multiple singles separate from this project. My first impression to her music was that it was a breath of fresh air for the pop genre, the broodiness of the lyrical content doesn’t get in the way of the fun of listening to it while Billie’s performance, personality, and execution shine through. The advertising of the album was rather intrusive much like drake’s 2018 release Scorpion, and the social media presence she has had the past year has stirred the topic that she could be an industry plant. The mix of the album is extremely spacious. The gaps between rhythmic beats are slow and drawn out, and with the sub-bass in certain parts can stick out, I personally like the utilization of bass in the songs. The first track “Bad Guy” opens up with a groovy bass line, spacious drum kicks that accompany it. This track surprised me as it sets the tone of the album but has its own distinct sound. The perspective told from Billie is quite hilarious, and the light hardheartedness of it all is enjoyable. The presumption that Billies’ youthfulness effects the lyrical depth comparing to her EP last year because they come off a bit “edgy” would be a wrong one. On the tail end of the album, listen before I go, Billie depicts someone waiting on a rooftop waiting to commit suicide thinking of her loved ones. Overall, I enjoyed listening to quite a bit of this album, the lyrics were clever and funny, vocal effects utilized have surpassed what was done before. I just think there is still left more to be desired and that Billie is still a young work in progress artist, but I see plenty of potential. This entry was posted in General, Media Trends & Tech and tagged billieeilish, IMA, Music, review, trends. It’s nice to see a music album review! Especially when it’s Billie Eilish. I have yet to listen to her full album but I got to peak at some songs because obviously I can’t wait. I love how her music is slowly evolving as she is still so young, especially in the industry she is in. She has such a distinctive sound and her turning more to the horror genre is a fresh look in the music industry. I agree that she has so much more potential despite already being so successful at her age. Overall, I think this is a great post! Overall there is a lot of good content in this post especially when your talking about previous albums and your opinion. I can really tell how you have a passion for music, and how interested you are on the subject. That being said there are a few grammar and spelling mistakes I saw in the post, the main point I saw when you said “the broodiness in lyrical content”. That would be with an a instead of two o’s. Also there is no pictures or illustrations of anything I think you could have added a album cover or a picture of Billie Eilish in the article some where. The last thing is that there is no supported content so you didn’t add any links. Other than those few mistakes I think this post is very well written, and the content is very interesting. I’m never one to read about music reviews, because, well, it’s music. But reading your review about Billie Eilish’s latest album sparked a little interest in me. She really is something different in the music industry as I don’t think I’ve ever heard content like hers. Initially, I thought she was a bit pretentious and didn’t like her style at first. I was used to appreciating actual singers who have vocal power, but I guess with Eilish you’d have to pay attention to her musical prowess more in terms of sound creation. Many artists like Eilish have emerged from the past few years so I’m not surprised, only they excel in different categories. Mura Masa was the master of lyrical beat and Lorde caught me with her eccentric song-writing. I can see how passionate and knowledgeable you are about music because of your ability to dissect her music and actually put it into words. It’d be much easier for you to get more people to listen to her songs though if you had provided as a link through your blog.